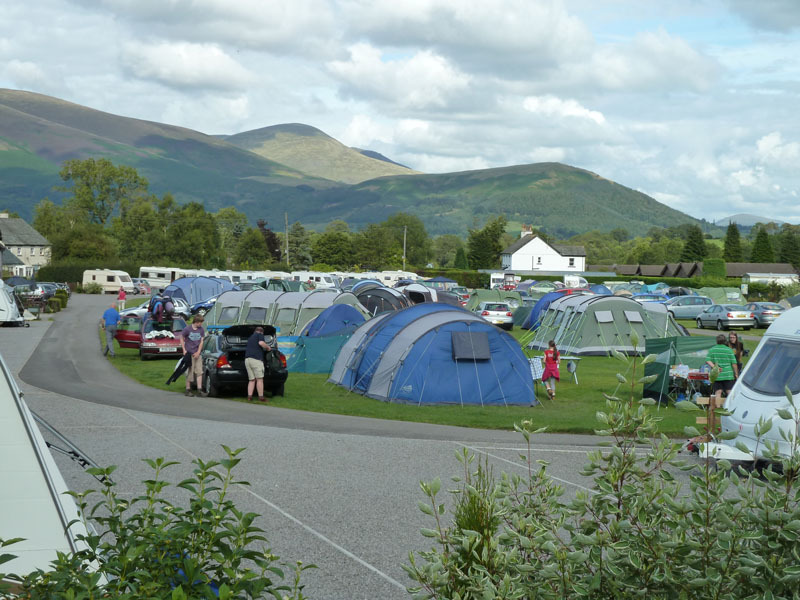 Eel Crag (Crag Hill on Ordnance Survey maps) is the fell that looms largest in the view south-east from Scotgate campsite in Braithwaite, where I'm camping. 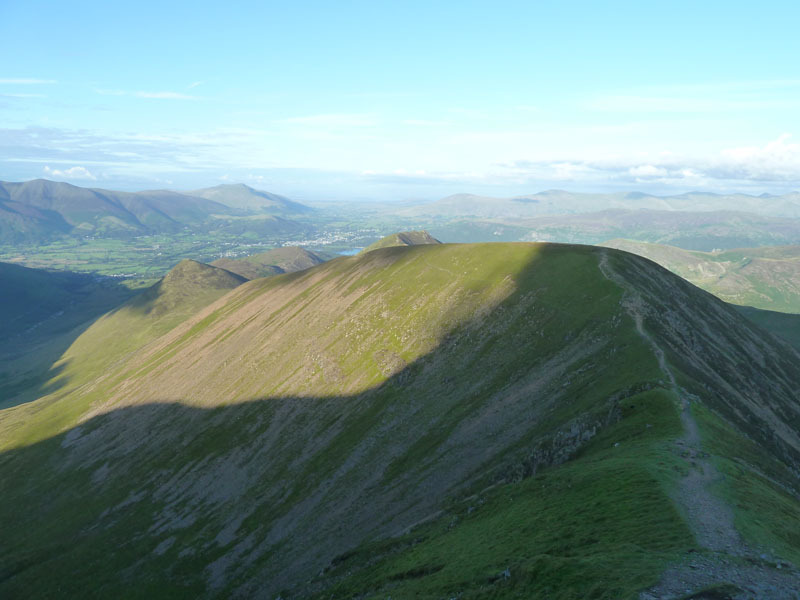 I've been on the summit a good few times, but never attempted a direct ascent as per Wainwright's Book Six. A busy place in the height of the holiday season. 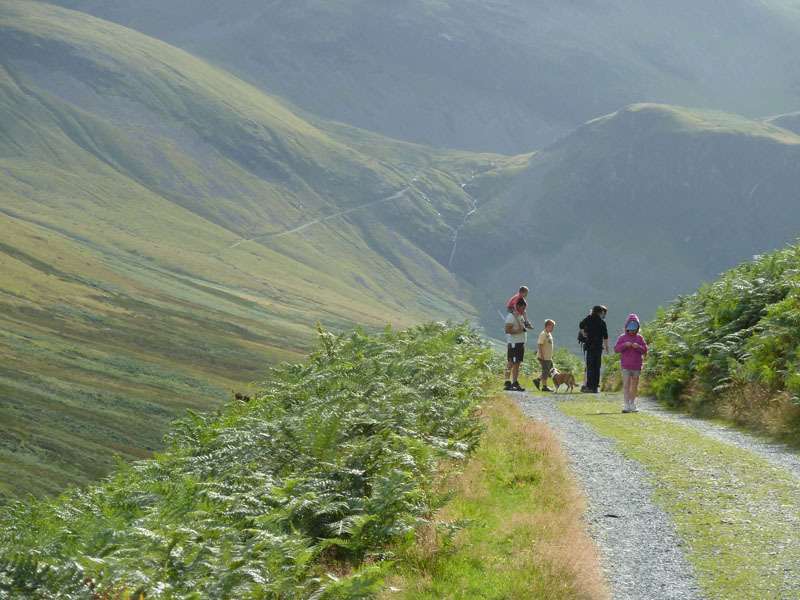 I took a gamble coming here, but there was room and it's an ideal base for fellwalking in the northern reaches of Lakeland. It's 16:30 and I'm ready for a leg stretch. 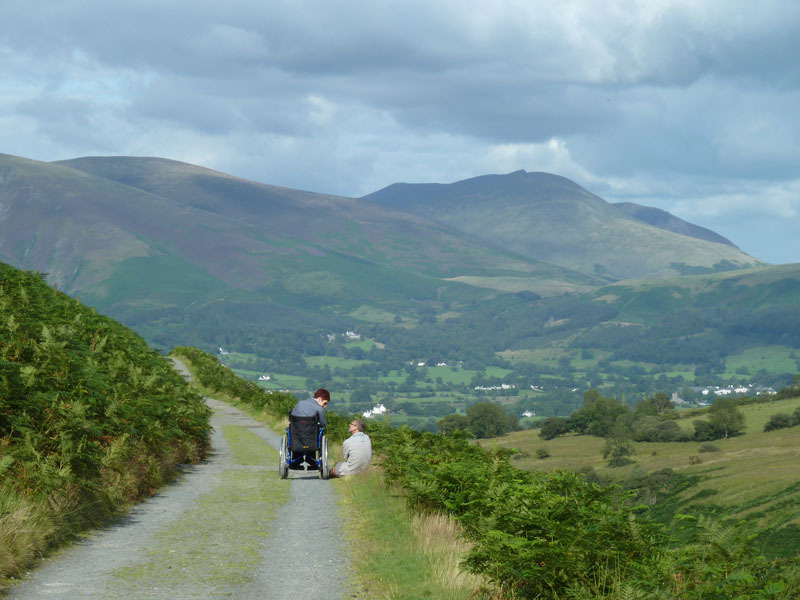 Taking the Whinlatter Road, there is a sneaky little footpath which links the tarmac with the Coledale mine road, it saves going up to the little car park and doubling back. 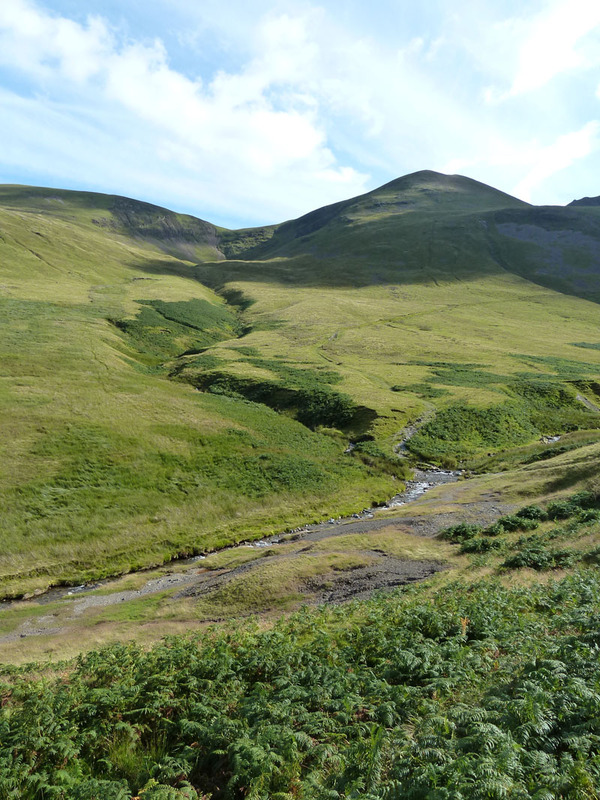 With height soon gained and arriving at the mine road, the view over Braithwaite opens up. 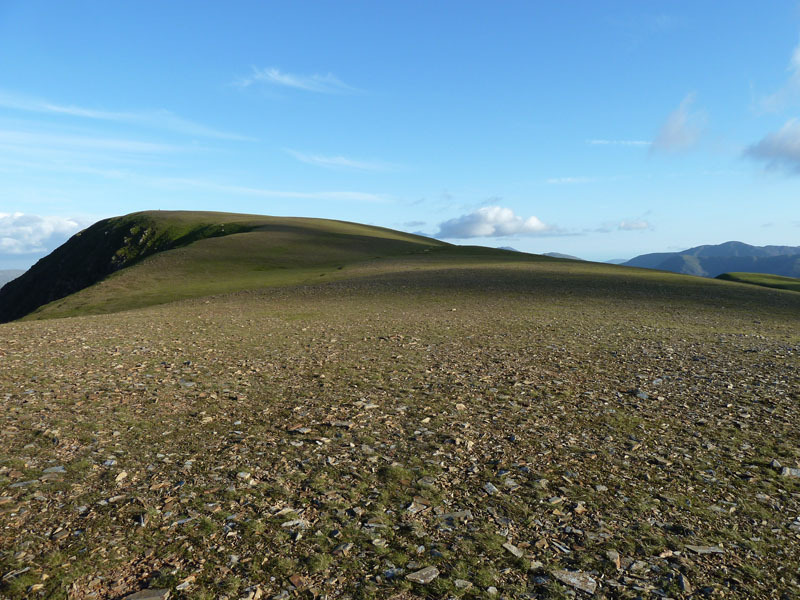 Great Mell Fell is the most distant bump on the horizon. 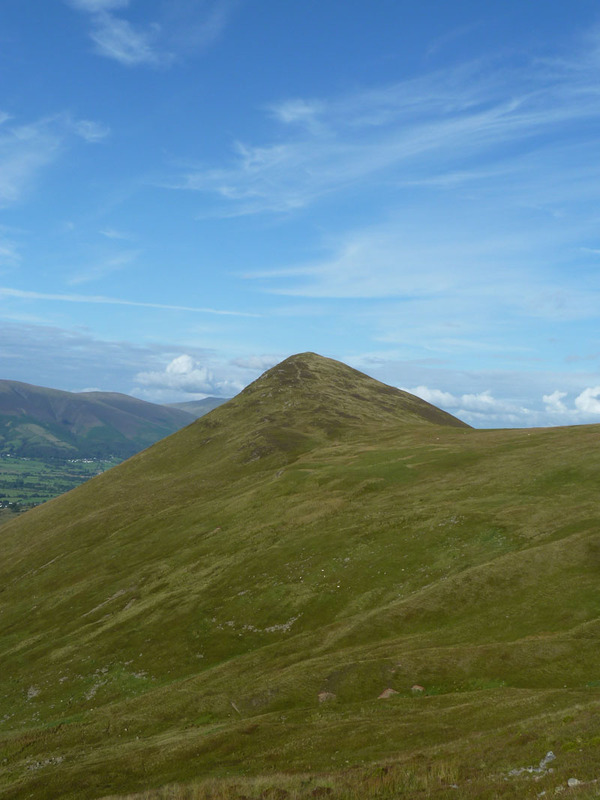 Latrigg on the left and Clough Head on the right. It's just over two miles from Scotgate to the ford over the beck, but it's easy walking and it was great to see the lady in the wheelchair able to access such a remote and beautiful place. 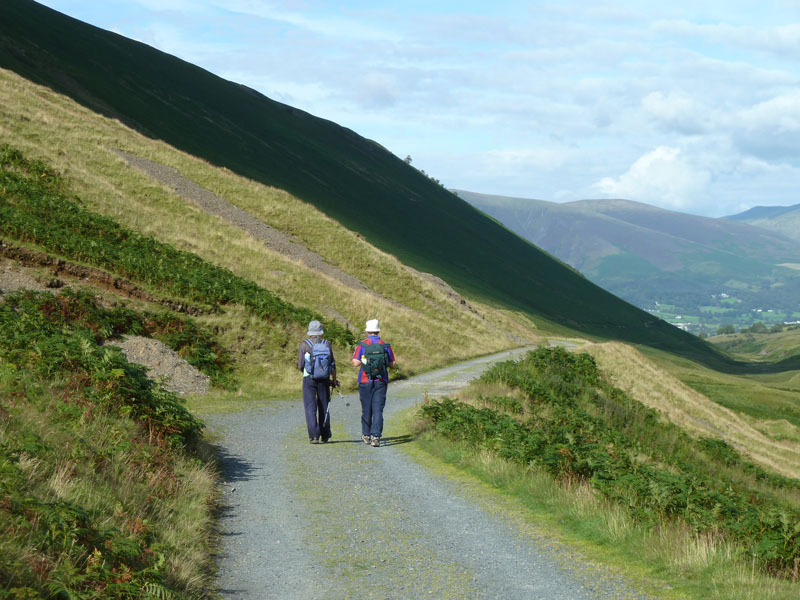 There were plenty of walkers and cyclists on the mine road. Bill & Ben, with their matching headgear turned out to be the last folk I saw on my walk. The ford was just fordable after recent rainfall. 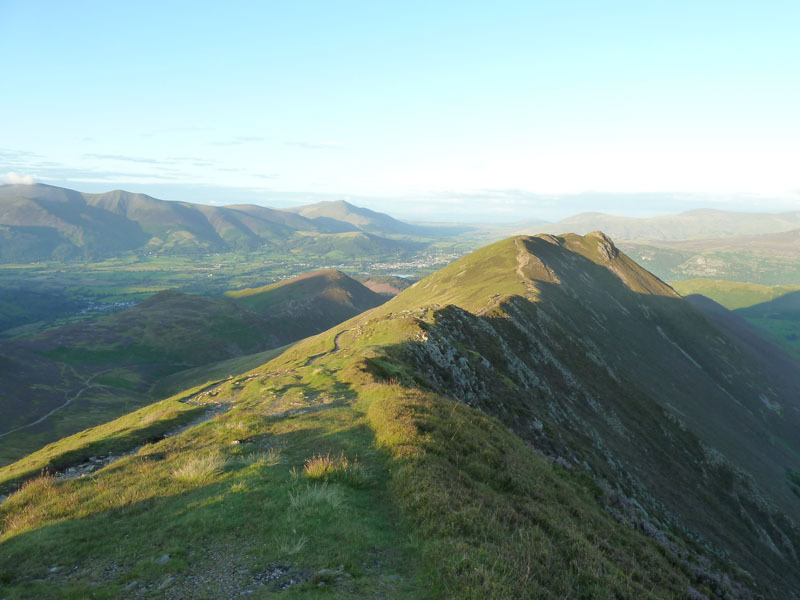 I took the path into Long Comb (Sail) before contouring round to find "The Shelf Route" up Eel Crag - as per AW NW Fells Page 7. I'd aimed for this back in May this year on a route off Outerside, but was discouraged by persistent rain and low clouds. The dramatic Force Crag and waterfalls. A view for the miners for countless years. 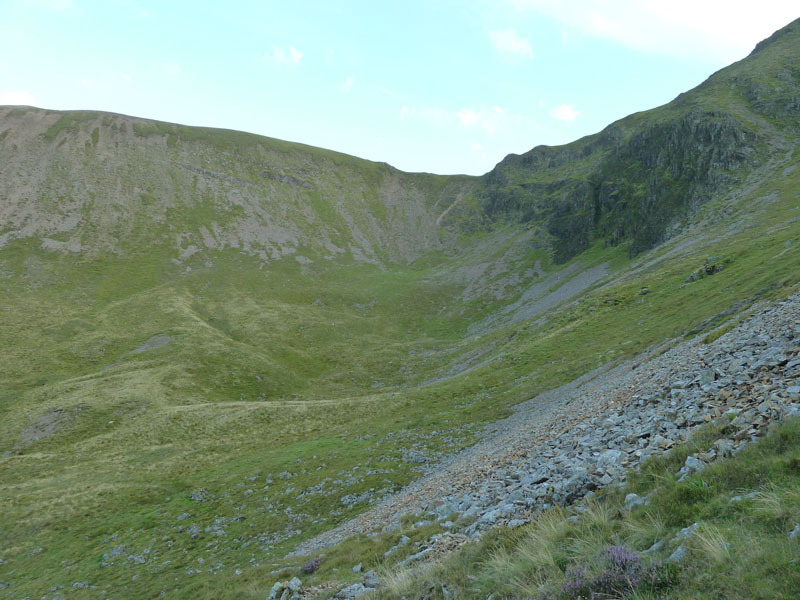 I've been reading Peter Wilson's book on Lake District Landforms and I think there may be a "Protalus Rampart" at the foot of Scout Crag. Go and have a look for yourselves and let me know what you think! 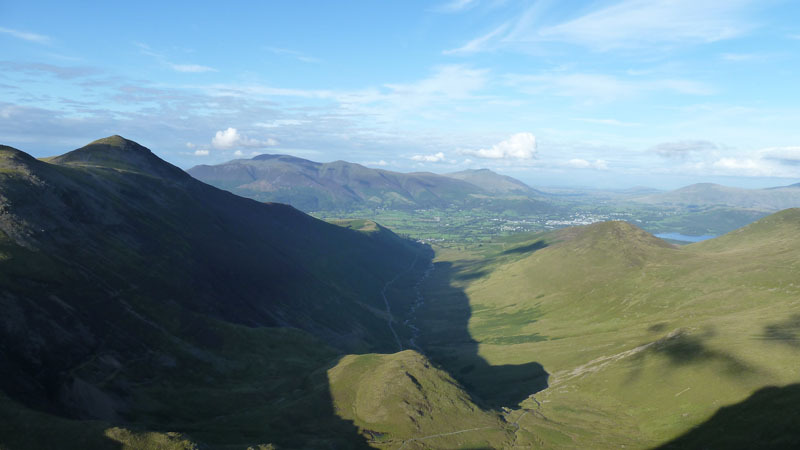 Skiddaw and Blencathra from The Shelf. 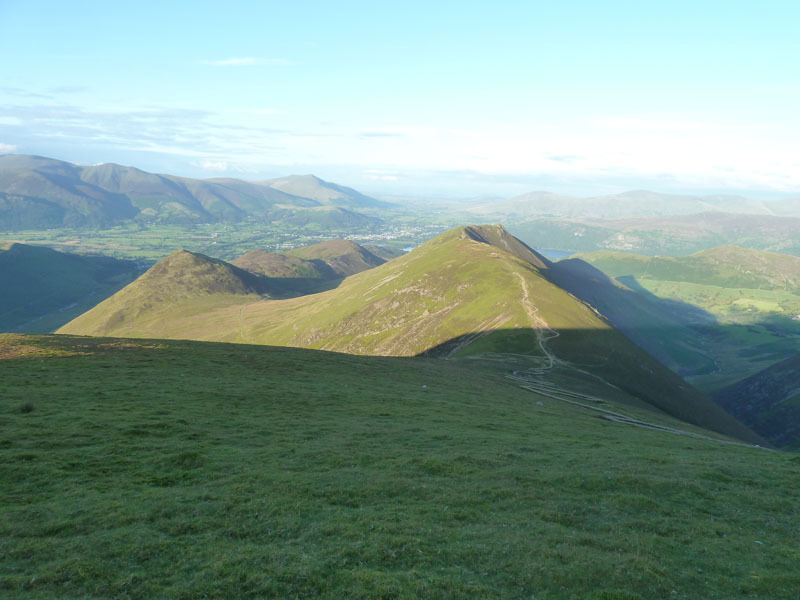 Outerside on the right and Grisedale Pike on the left. 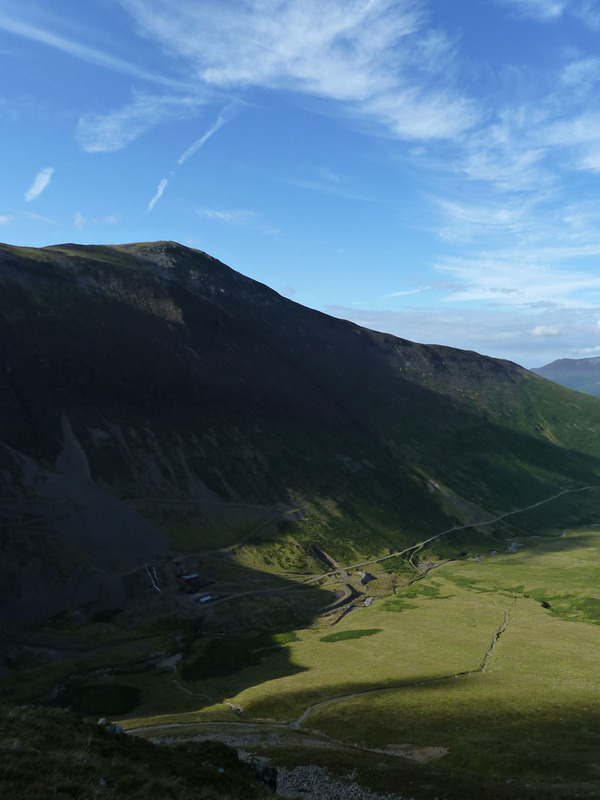 The Shelf Route offers unrivalled views of Coledale and Force Crag. 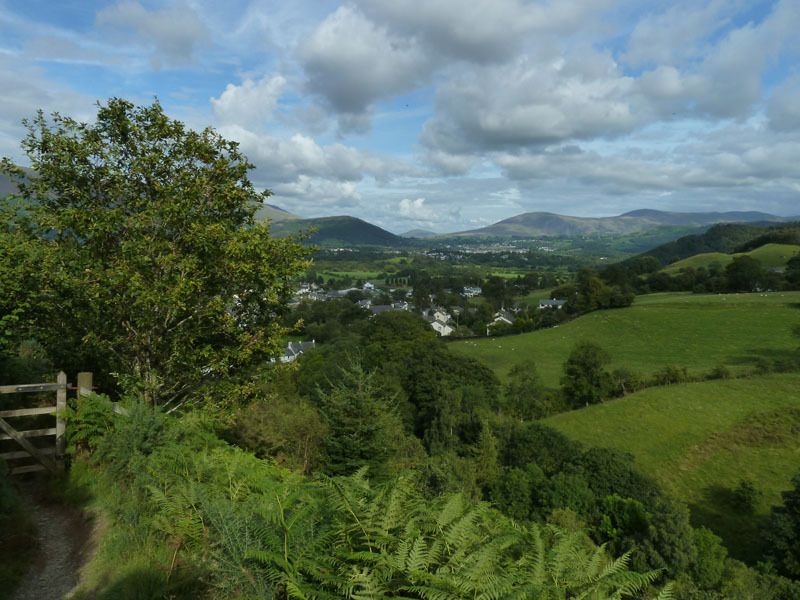 A little bit of Derwentwater comes into view. Very fragile rockface on Eel Crag, ready for a tumble in my opinion. 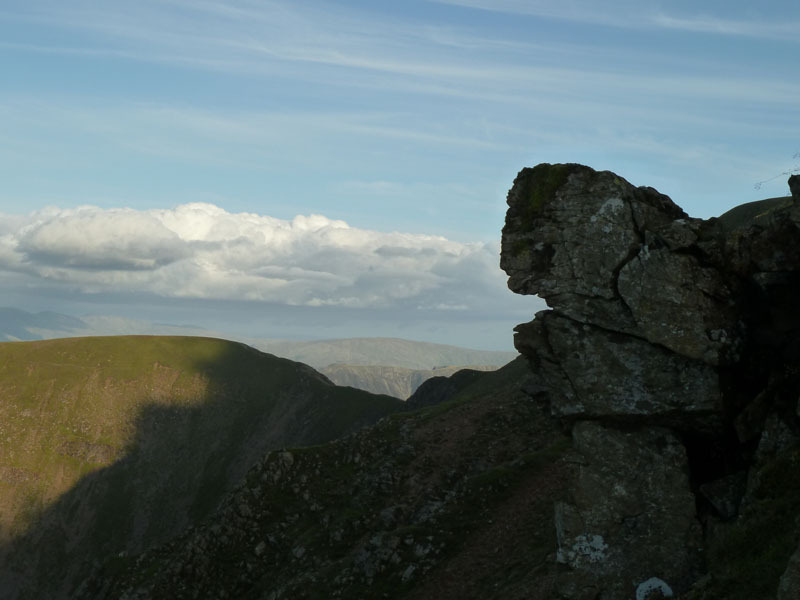 Long flat top of Crag Hill (Eel Crag in Wainwright Books). The Trig Column is not far from collapsing. 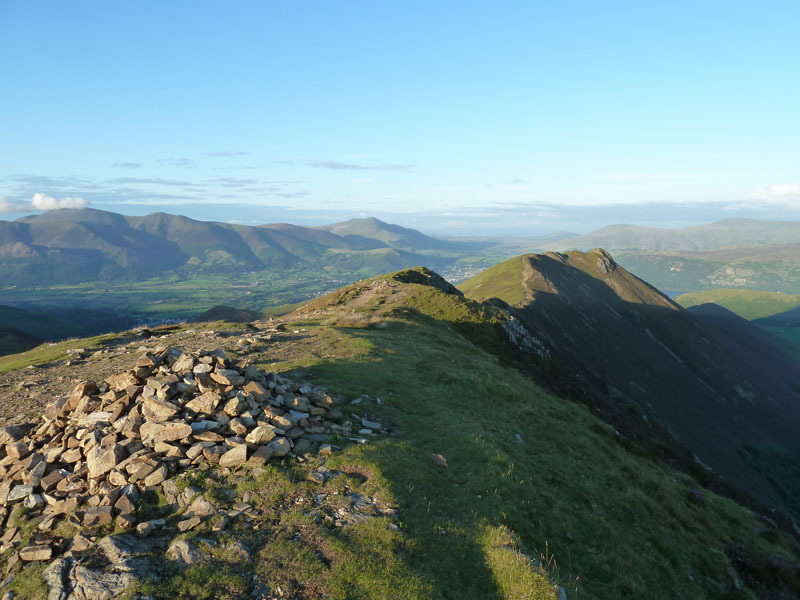 This is a tragedy, this is one of my favourite fell tops and the trig is an important part of the landscape un here. We need sand, cement, water, a board, a trowel and some volunteers and we need them soon. 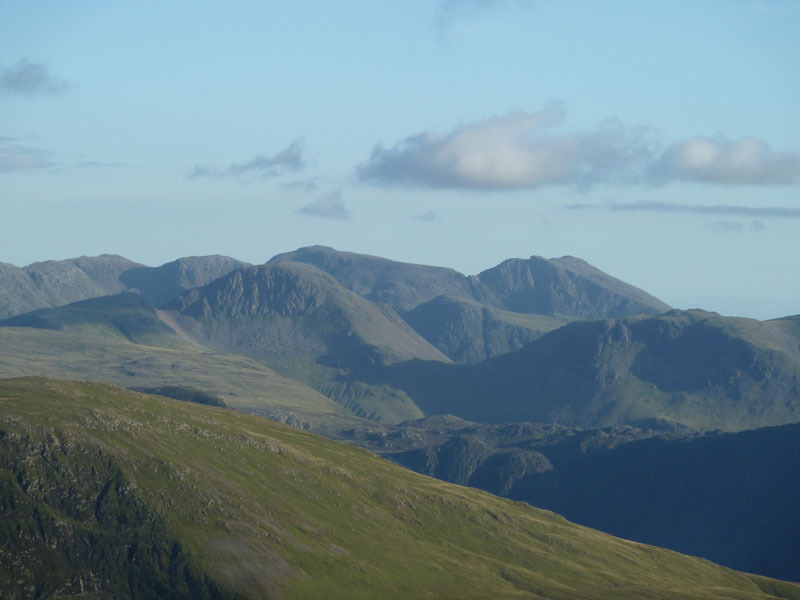 Robinson from Eel Crag. 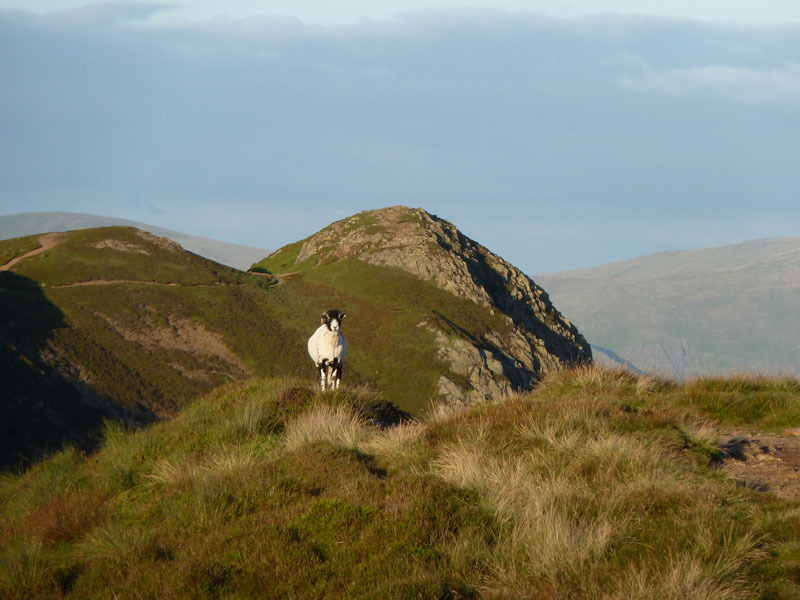 The ridge of Knott Rigg nearer the camera. 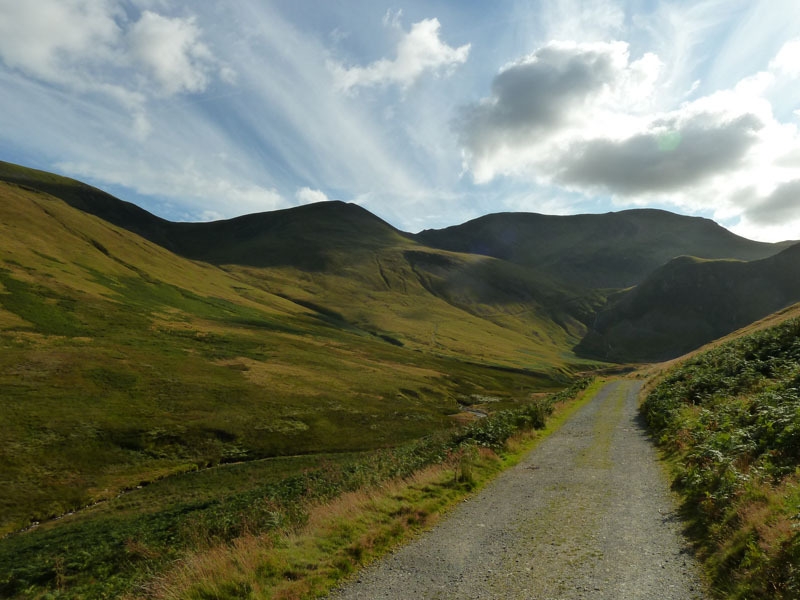 My route leaves Eel Crag and heads for Sail. If Robinson has a "prosaic" name, how about Sail? Sail is not one of my favourite summits, but it does possess a puddle and I've used it as foreground for this view back to Eel Crag. 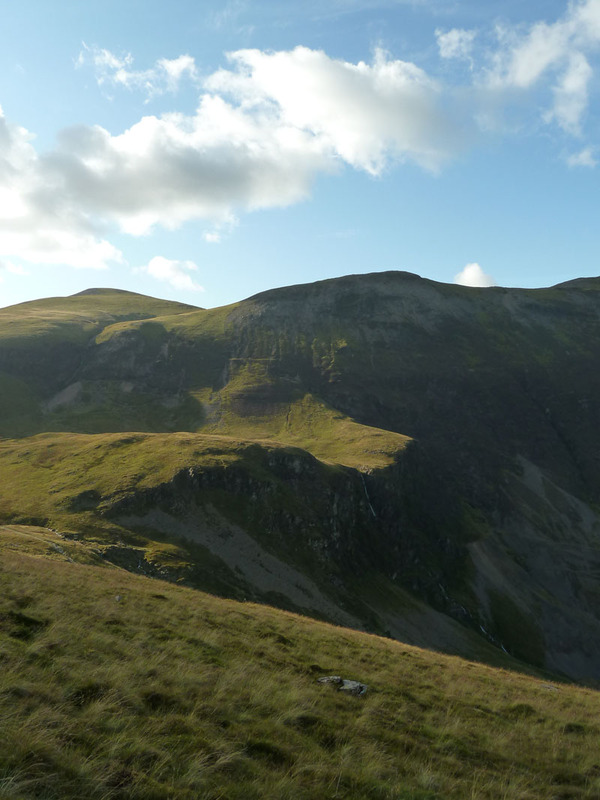 Directly in front is Scar Crags, to the left is Outerside. 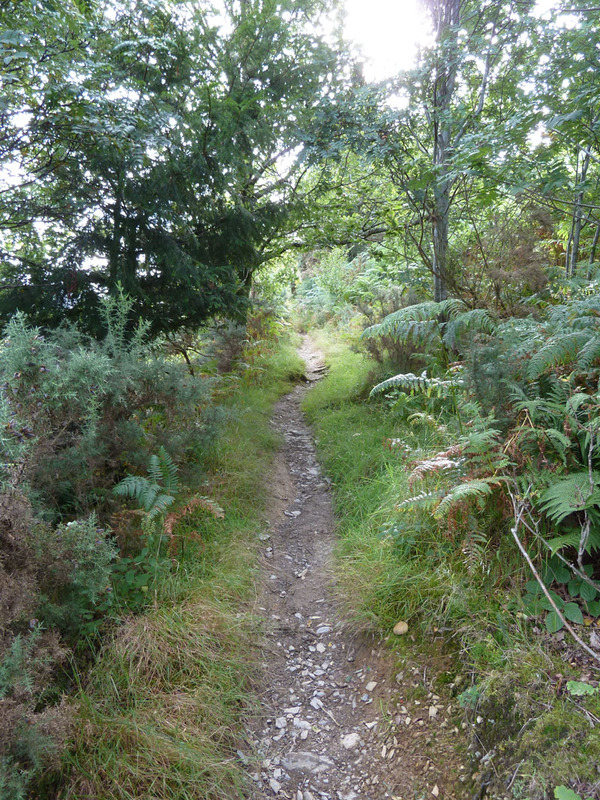 It's possible to avoid the zig-zags by taking a path to the left. Is that the right thing to do? Or should we extend our walks by zigging and zagging on the manufactured walkway. Discuss. 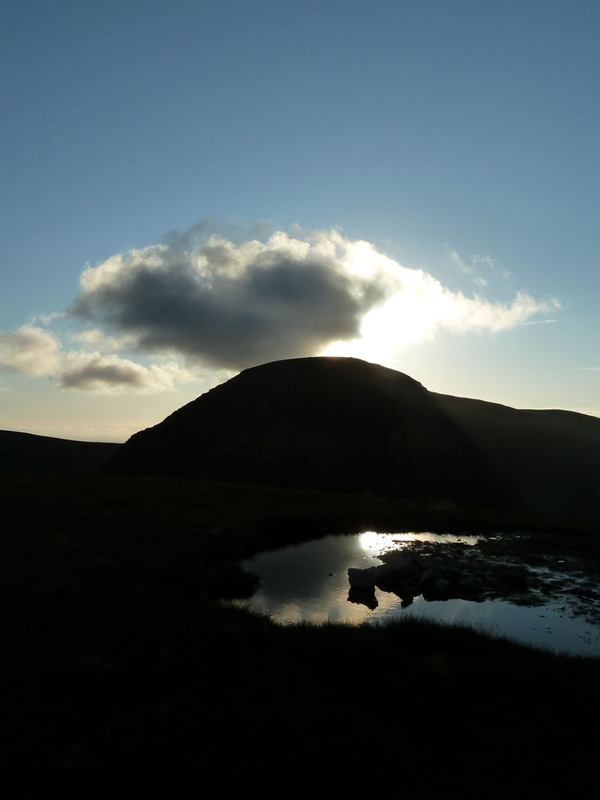 The highpoint of Ard Crags clings on to the last of the day's sunshine. 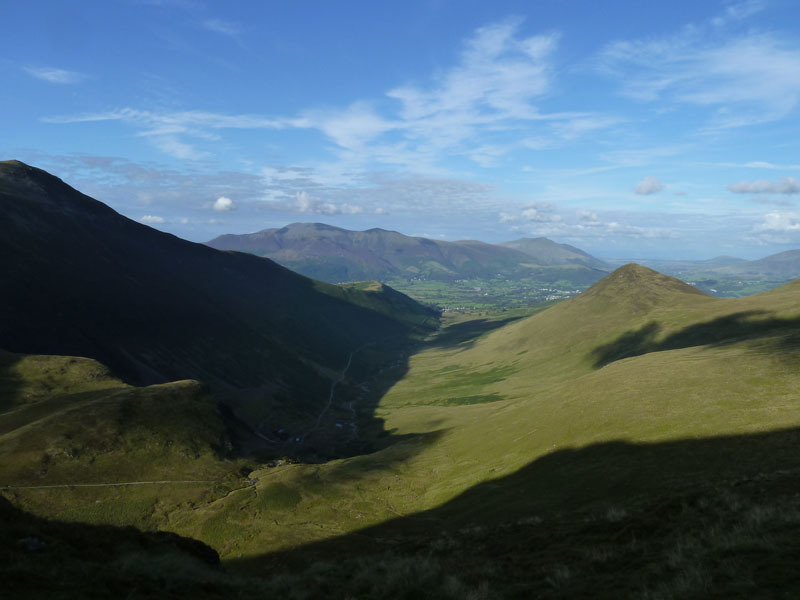 There is still time to carry on to Causey Pike. 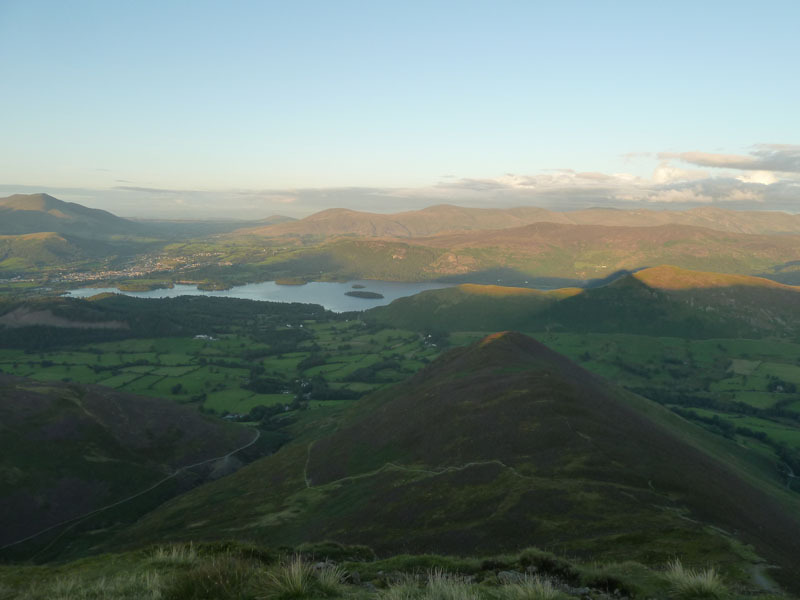 It occured to me that my monthly phone bill needed paying by tomorrow, so I wonder if I'm the only person ever to pay their phone bill by card from the top of Causey Pike? 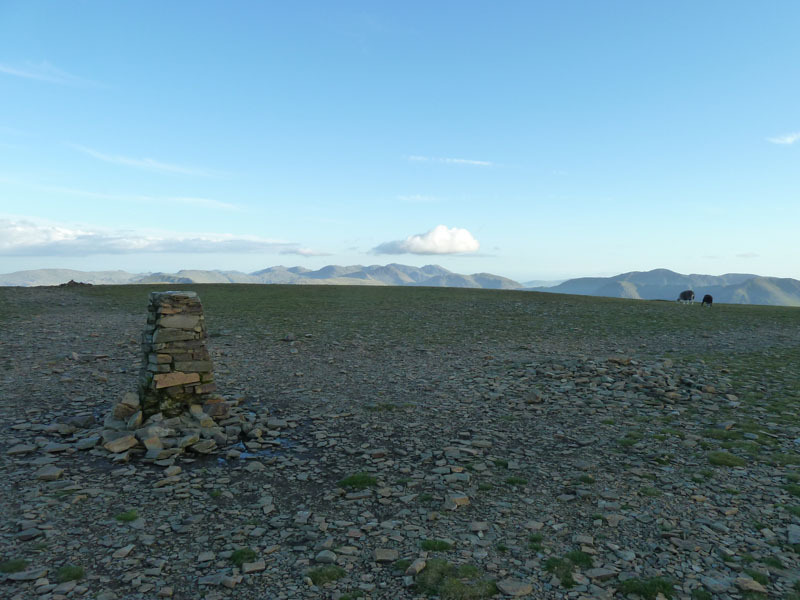 The summit stands at 2035ft asl and is just 3/4 mile away. 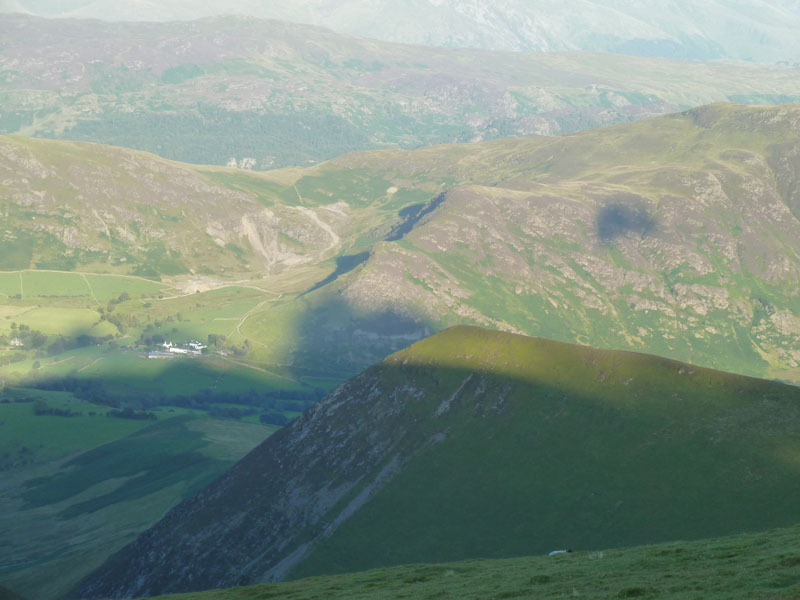 A true "Ridge Route" if ever there was one. My route is down into the dip and then off to the left to Stonycroft Bridge. Time to put the camera away. What a great way to spend a summer evening! Time taken: 5hrs over a distance of about 10 miles. 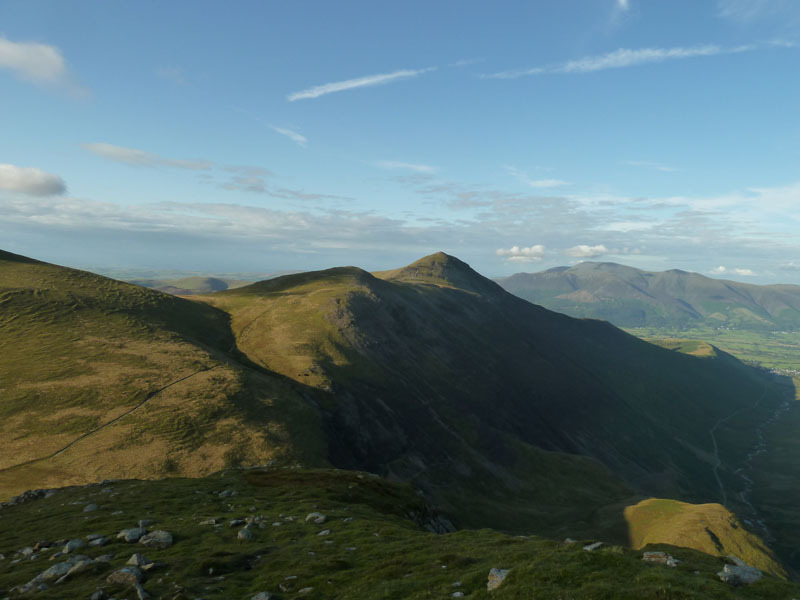 Route: Braithwaite, Coledale Mine Road, The Shelf Route to Eel Crag, Eel Crag Summit, Sail, Scar Crags, Causey Pike, Stonycroft, road and bridlewway back over to Braithwaite. 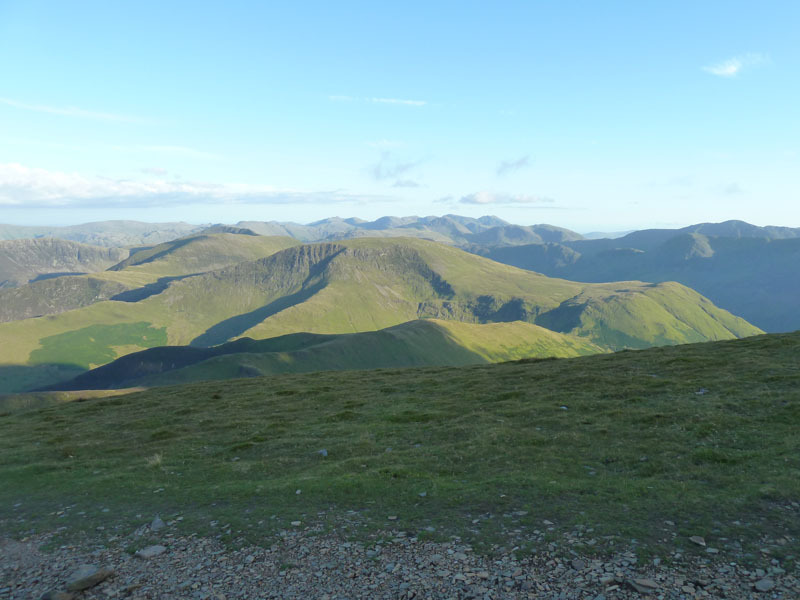 Weather and conditions: Sunny, cooler on the tops, little in the way of wind. Greetings Count: The first person I spoke to was Maggie, friend and fellow fellwalker. 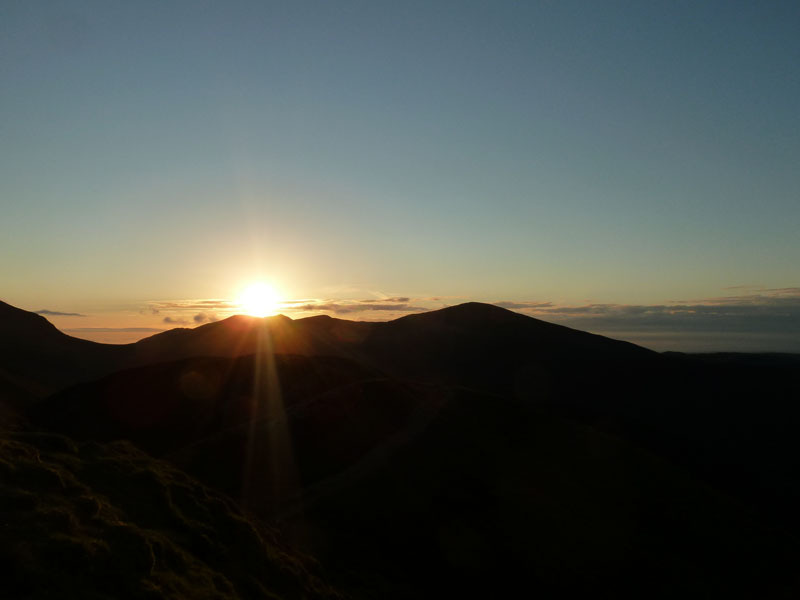 She stopped her car at the foot of Whinlatter Pass and reported on her day out on Pillar. Then it was busy on the Coledale mine road, the last folk I saw were those chaps with the flowerpot hats.